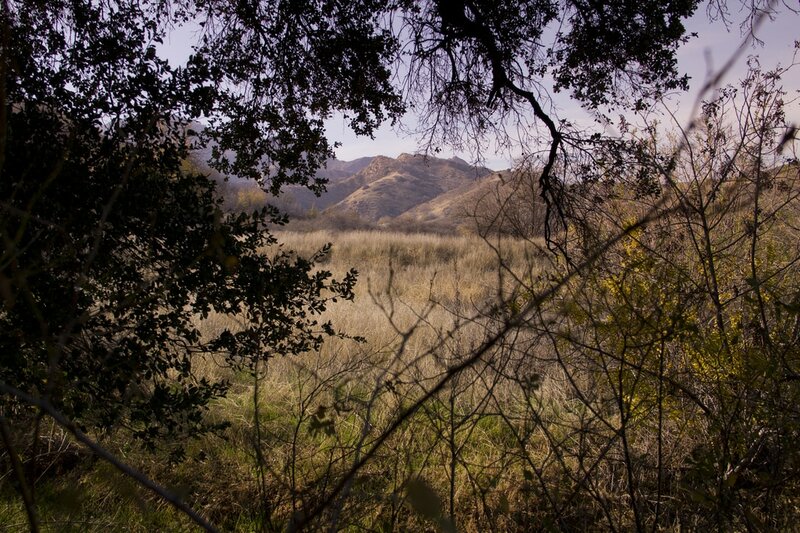 I recently made the trip up the 5 to Santa Clarita to check out the Don Mullally Trail at Ed Davis Park. It’s a nice family hike with some pleasant views of the Sierra Polena Mountains and the Newhall Pass. But there was a second hike in the park that intrigued me, the longer Towsley View Loop Trail. 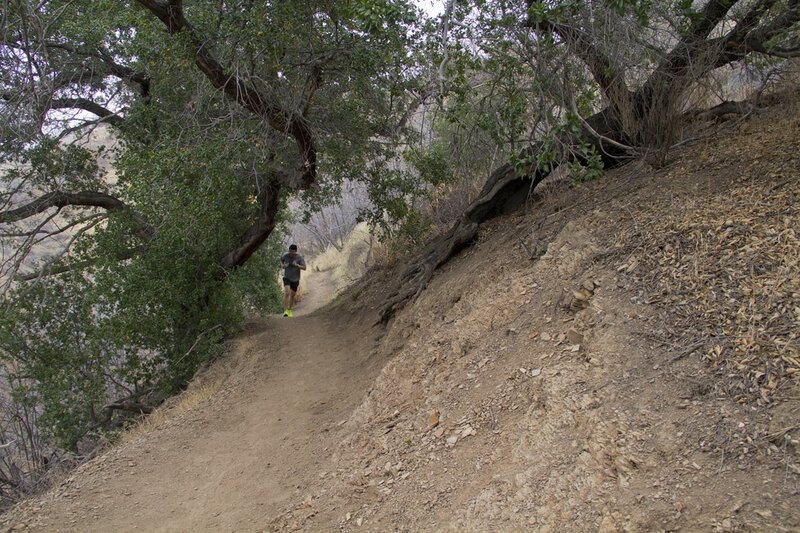 This is a 5.1 mile trip deeper and higher into the Santa Clarita Woodlands through Wiley and Towsley Canyon. I hesitated doing two hikes so close together, but Towsley View seemed to offer more of a challenge and since it was so close, I couldn’t resist. I was well rewarded for the effort. the back country, there was a surprising amount of traffic on the trail ranging from trail runners and hikers to mountain bikers. 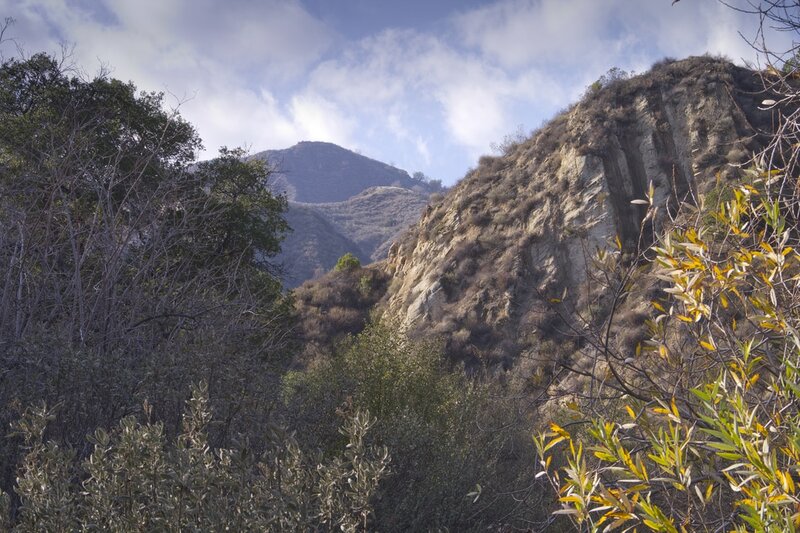 The trail offers a mixture of meadowlands, grassy balds and riparian landscapes along with some fantastic views of the Sierra Polena Mountains to the north and interior views of the Santa Susana Mountains. The trail begins in the main parking area at an information sign on Towsley Canyon Road. Following the road for about .1 mile, you’ll enter a small grassy meadow with hills rising to either side of the road. On your right, the hills are barren having been burned down to the soil in recent wildfires. To your left, the hillsides are covered in majestic oaks and California chaparral. The contrast between the two is stark and a reminder of the ferocious power of wildfire. Continuing through the junction on the Towsley View Loop Trail you will enter a mixed-riparian landscape of oak, alder and sycamore trees growing along the creek bed that follows the path. Wetter seasons make this a delightful walk as water tumbles over boulders in the stream. Unfortunately, our current drought has made this a mostly dry trough. As you press further into the canyon, sheer rock cliffs of sandstone and shale rise to either side and makes for some interesting bouldering opportunities. At around the 1-mile mark you may begin to notice a pungent sulfur-like smell. This odor is caused from sulfur, oil and natural asphalt bubbling up from deposits located beneath the mountains. This whole area was once heavily drilled for petroleum products and you will see remnants of this history throughout your hike. Just before Trail Junction 3, the trail widens slightly and you may notice what looks to be, at first glance, a fire pit on your right. 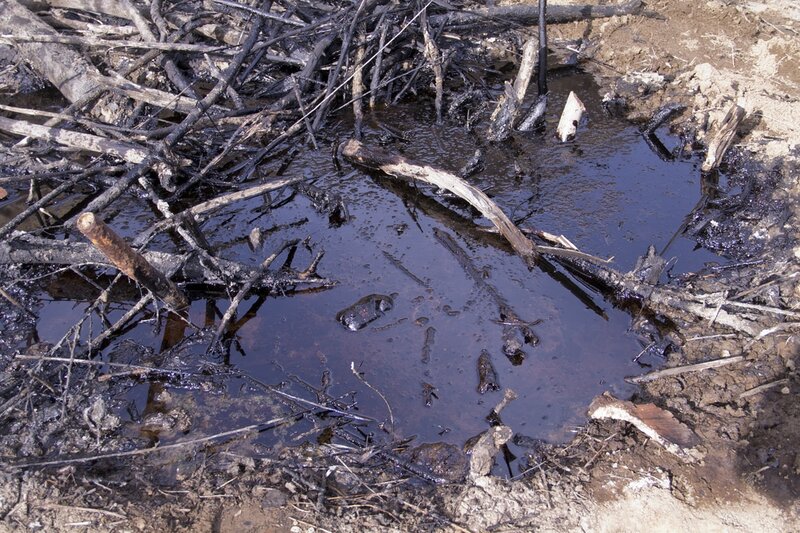 Closer inspection, however, will reveal a tar pit with oil and sulfur bubbling to the surface. This is just one of several such pits you will encounter. As you pass the tar pit, the trail will turn sharply right at Trail Junction 3, marked with an old weatherworn bench. The trail to this point has been relatively level and easy going. From here you will begin an upward ascent and climb nearly 1,000’ in about 1-mile. The trail doesn’t look all that steep, but once you start climbing your legs will definitely feel it. And the climb seems to go on and on and on. Luckily, the views begin to open up and distract you from the burning in your legs. At about 1.5-miles there are some lovely views across Wiley Canyon to the Santa Clarita Valley and the hills of the Sierra Polena Mountains. ​The surrounding hillsides are home mule deer, coyote, kangaroo rat, bob cat, ring-tailed cat and the occasional mountain lion. There is even a small population of black bear roaming through the backcountry. A wide variety of birds also call the Santa Clarita Woodlands home, including red-tailed and red-shouldered hawks, California Towhee and the rufous-sided towhee. If you finishing your hike around dusk, you may also hear the calls of Great-Horned Owls and the Common Poorwill. At around 2-miles, the long ascent ends and the trail levels out a bit along an upper ridge. Here you’ll find great views of the Sierra Polena and San Gabriel Mountains, the Newhall Pass and interior views of Towsley Canyon. Just short of 3-miles, the trail descends along a series of switchbacks that helps take some of the steepness out of the trail. As you make your way back to the canyon floor, you’ll pass over another tar pit and find relics from the days when oil derricks dotted the landscape. As you return to the canyon floor, you will follow Towsley Creek to a large V-shaped cut in the rocks known as The Narrows. Over a millennia, Towsley Creek has cut a narrow passage through the cliff face and meanders lazily to the entrance of Towsley Gorge. This is a gorgeous spot with some really cool geologic rock formations to crawl around on. And the gorge below the narrows is rich with thick vegetation even in the dry seasons. Wetter seasons or right after a heavy rainfall may necessitate boulder hopping through this narrow canyon. The single-track trail exits The Narrows onto a dirt fire road that winds leisurely to the picnic area at Trail Junction 5. As you hike this section, don’t forget to turn around and look back. Some of the best views of the canyon and surrounding mountains will be located behind you. 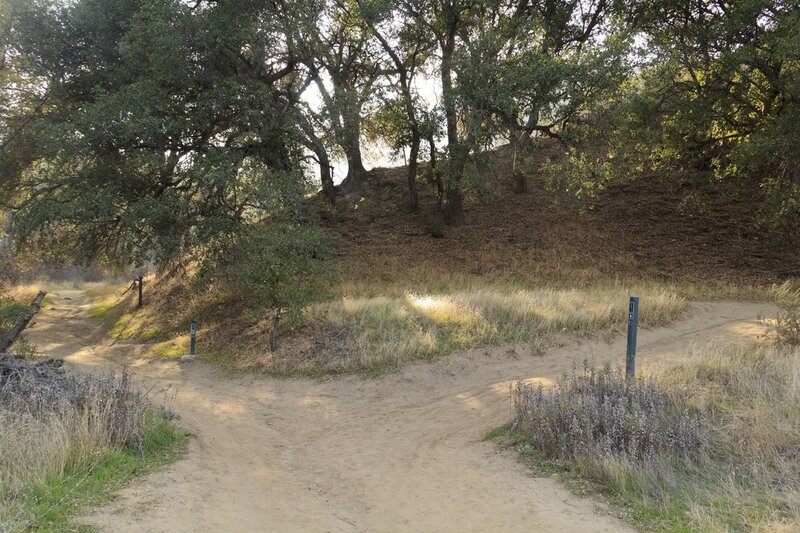 At Trail Junction 5 you will meet up once again with the paved Towsley Canyon Road. To end your hike, simply follow the road for just over half of a mile to the parking area. 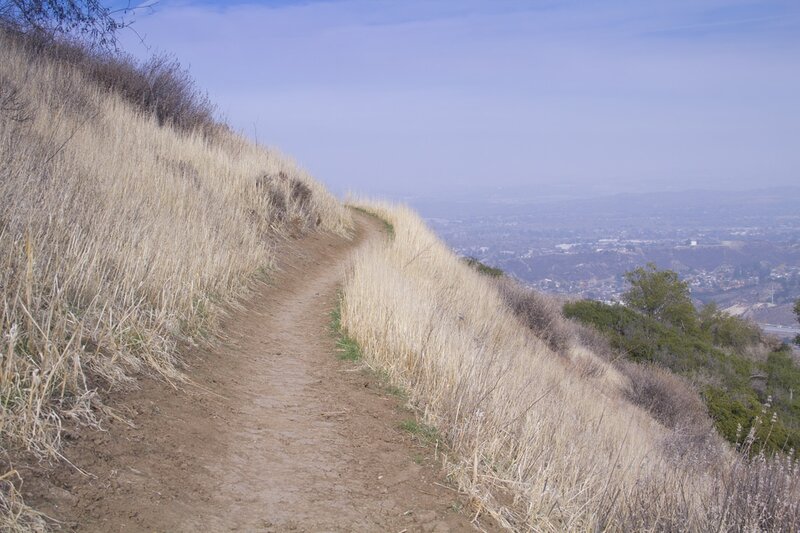 An alternate ending to your hike will have you pick up the Don Mullally Trail just off the foot bridge at Trail Junction 5 and climb back up to a lower ridge for a few more views of Santa Clarita and the Sierra Polena Mountains. This will add a bit more ascending and descending to your hike and add about a half-mile to your total trip distance. The Don Mullally Trail will end at Trail Junction 2 on the Towsley View Loop Trail as noted earlier. Turn left at the trail junction and make your way back to the parking area. 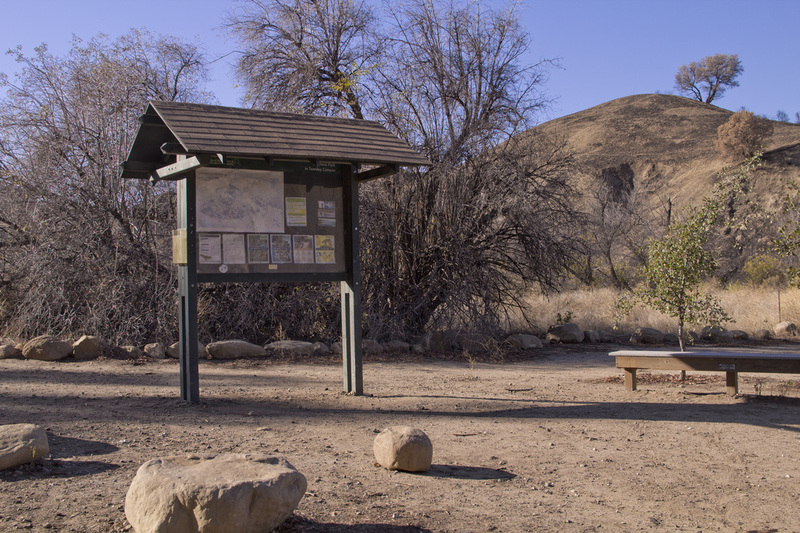 If you need to recuperate a bit before tackling the Don Mullally Trail, the picnic area at Trail Junction 5 is a great place to rest up. There are picnic tables scattered about a lush grassy area beneath a stand of cottonwoods. ​You can hike the Towsley View Loop Trail in either a clockwise or counter-clockwise fashion. Trail runners and mountain bikers tend to do the loop in a counter-clockwise fashion as the ascent is not quite as challenging and makes for a faster descent. For hiking, I prefer to do the loop in a clockwise fashion as the views, geologic formations and other elements of the hike build to a stunning finish at The Narrows and Towsley Gorge. Hiking in a counter-clockwise fashion frontloads the hike with all the big scenic elements. But no matter which way you hike this loop trail, Towsley View is one of the jewels of Southern California. Head north on the 5 and cross over the Newhall Pass past Sylmar. As you come out of the pass and into Santa Clarita, take Exit 166. At the bottom of the exit, turn left onto Calgrove Road. As you pass under the 5, Calgrove will become The Old Road. The entrance to the park will be just ahead on your right. It’s not marked well and is not much of an entrance, so keep your eyes peeled. From the exit on the 5, it’s only about .33 miles to the park entrance. You have several parking options. Along the frontage road and just inside the park are free parking areas. If you drive past the information sign, there is a $7.00 parking fee. This guide assumes you will park in the free areas, and the trailhead begins at the first information sign. The trail begins at the information sign at the second free parking area. Continue on the paved road (Towsley Canyon Road) for .1 mile to Trail Junction 1. At .1 mile, you reach Trail Junction 1 with a narrow dirt fire road coming in on your left. This is the Towsley View Loop Trail. Make the turn and pass around the metal gate. Continue on the fire road for .33 miles to Trail Junction 2. At .43 miles, you will reach Trail Junction 2 with the Don Mullally Trail connecting on your right. If you choose to end the hike with the Don Mullally Trail, this is where you will reconnect with the Towsley View Loop Trail. For now, continue through the junction and remain on the Towsley View Loop Trail. At just about 1 mile the trail opens up a bit and you may notice a foul, sulfur smell in the air. Look to your right for what at first glance may look like an old fire pit. This is actually an oil seep with fabled 'black gold' bubbling up from beneath the Santa Susana Mountains. Just past the tar pit at 1.1 miles, the trail makes a sharp turn to the right at a bench and marks the beginning of a long and somewhat steep uphill climb. Beginning at around 1.5 miles you will have fairly continuous views of Santa Clarita, the Newhall Pass and the Sierra Pelona Mountains as the trail climbs out of Wiley Canyon toward Towsley Canyon. On clear days, these views can be quite spectacular. At around 2.0 miles, the trail finally levels out along the ridge that separates the two canyons at elevation of around 2400'. At 2.7 miles you will pass over a knobby hill with a small copse of trees. There are several photo opportunities in this area. 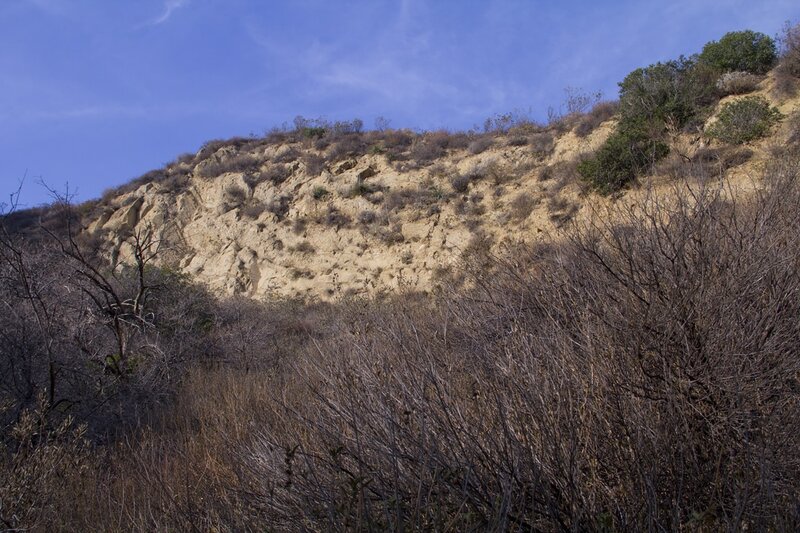 At roughly 2.8 miles you will begin a fairly rapid descent along a series of switchbacks into Towsley Canyon. At 3.2 miles, cross over a tarry stream of seeping oil. Along this section of trail, look for old cables and other evidence of the oil production machinery that used to dot the landscape. A single-track trail branches off to your left at mile 3.5 as Towsley Creek rises up to meet the trail. Continue straight through the junction toward The Narrows, a V-shaped cut in the mountain directly ahead. 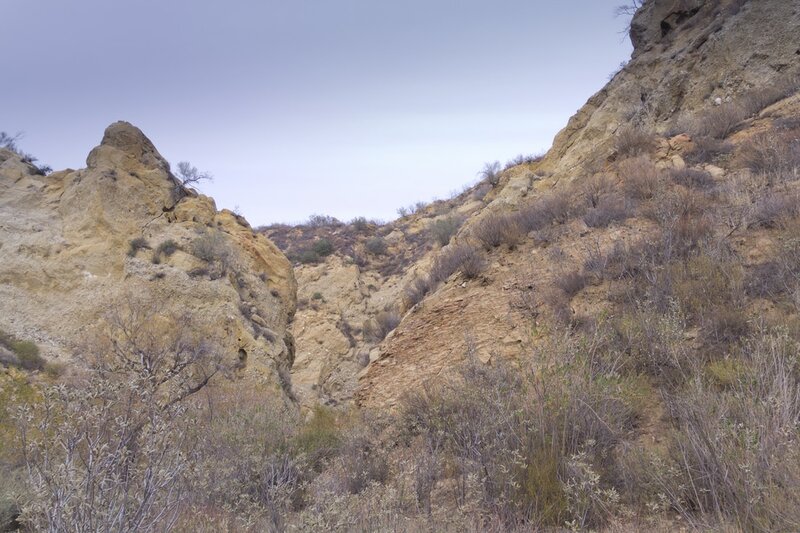 Towsley Creek has cut through the cliffs creating a narrow, rocky passageway out of Towsley Canyon. There are some interesting rock formations perfect for bouldering as you make your way along the creekbed. During wetter weather you may have to do some boulder hopping or even get your feet wet! 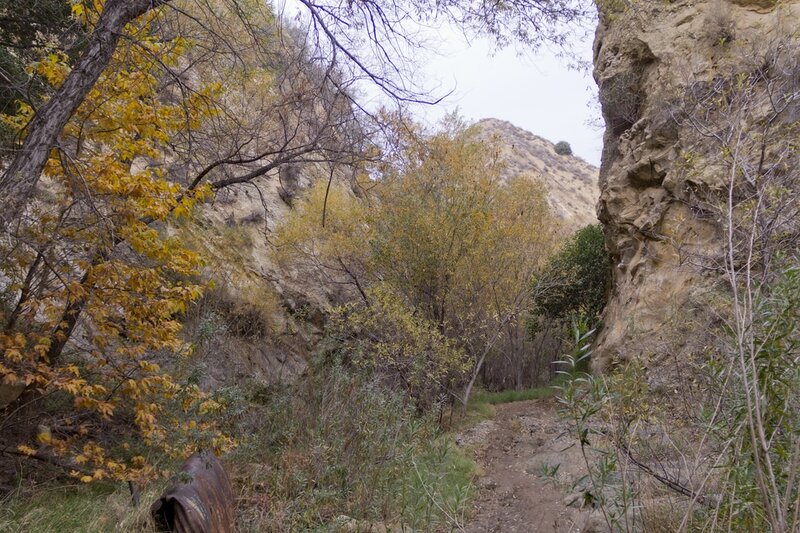 ​At 4.5 miles, the fire road joins the paved section of Towsley Canyon Road at the picnic area. Continue along the road for .6 miles to the parking area. For a more varied hike, you may pick up the Don Mullally Trail at the footbridge and continue through the hills with some additional panoramic views of the surround mountains. The Don Mullally Trail ends at Trail Junction 2 on the Towsley View Loop Trail. From there, retrace your steps to the parking lot. 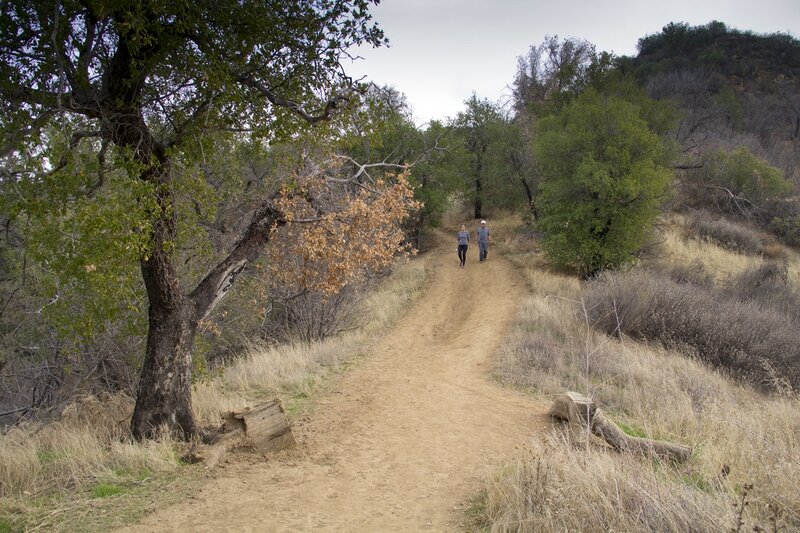 Utilizing the Don Mullally Trail to complete your hike will add a little over a half mile to your total hiking distance. A grassy, shaded picnic area with restrooms, water and a nature center. A small nature center featuring wildlife dioramas. ​This 1.1 mile trail follows the lower ridgeline back to the beginning of the Towsley View Loop Trail. 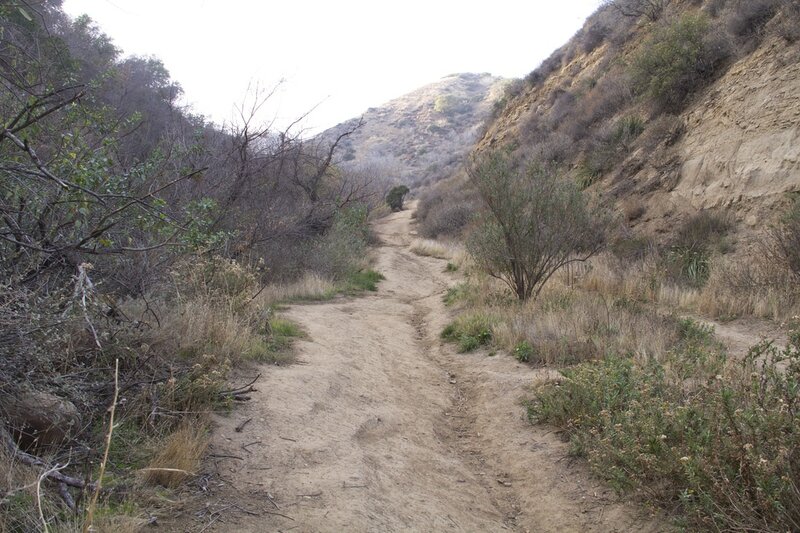 Utilizing this trail to finish your hike will add some extra hills and about .6 mile to your total hiking distance. Congratulations! You have completed the 5.1 mile Towsley View Loop Trail.